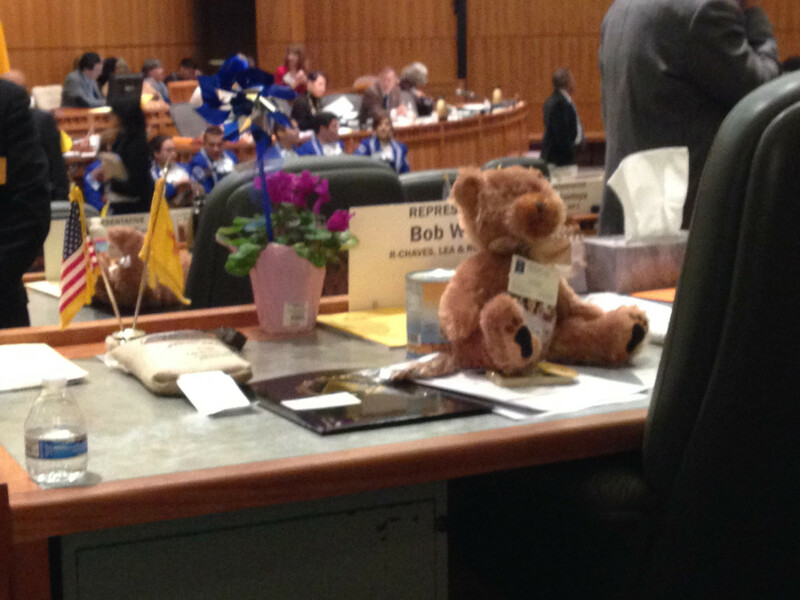 Teddy bears from the New Mexico Primary Care Association adorned the desks of House members Thursday, Feb. 5. Lobbyists for the organization distribute the bears annually. The state House voted Saturday to peel back the curtain a little on lobbying in Santa Fe, but it was a small step toward revealing how money flows through the halls of the Roundhouse. The bill, HB 137, asks lobbyists to fill in a few more fields when they file spending reports using the Secretary of State’s online Campaign Finance Information System. It’s sponsored by Rep. Jeff Steinborn, a Las Cruces Democrat who regularly introduces transparency-related bills. Instead of being able to say they spent, say, $10,000 entertaining “various legislators,” people who are paid to influence state government will have to list exactly how much they spent on dinners, drinks or campaign contributions for each separate lawmaker. “It’s important for citizens to see the money being spent to influence individual legislators,” Steinborn said after the vote. The bill represents one element of a larger package of disclosure efforts that were halted by a House committee in 2015. Lobbyists howled at what they described as onerous and career-threatening requirements. Rep. Steinborn brought the ideas back this year as separate pieces of legislation. New Mexico has relatively lax requirements for those who seek to influence state government. It failed a nationwide investigation of accountability, ranking 43rd in the nation for the not giving the public very much information about how much money companies and organizations are paying to affect the legislative process. The report, conducted for the Center for Public Integrity, (and conducted by this reporter) also found weak enforcement of existing laws by the Secretary of State’s office. Efforts to introduce more transparency into lobbying have significant public support. A 2015 poll conducted for Common Cause New Mexico showed 89 percent of voters want to know which bills or issues lobbyists are working on. Nearly two-thirds say they think elected officials are more responsive to lobbyists than voters, according to a 2016 survey done for a Washington-D.C. business think tank. The other bills would have asked lobbyists to report how much they get paid (HB 135) and to list the specific issues and bills they’re being paid to work on (HB 136). Gov. Martinez did not add those bills to lawmakers’ agenda this session. Although the bill passed the House with a large majority, it must pick up speed to get through the Senate by the time the session ends Thursday.